Traditionally, 30th anniversaries are celebrated with pearls. This custom can be used to inspire a beautiful and elegant (or casual) anniversary party. When we think about pearls, images of oysters on the beach, gently swaying in the waves come to mind. It also leads to pastel colors of opalescent whites, pinks and blues. Use this imagery to design your party and it will come together perfectly! Some guests may not understand the correlation between the pearl and your 30th anniversary. While you don't have to be direct about it, it would be nice to mention the symbolism somehow. This may encourage some women to break out their best pearls for the occasion or couples to dress in swanky whites to match the affair. This is not a Hawaiian luau and 'pearl' is not an obvious party theme... clue them in! Whether you do e-vites or send out paper invitations make sure you include any instructions for your guests. 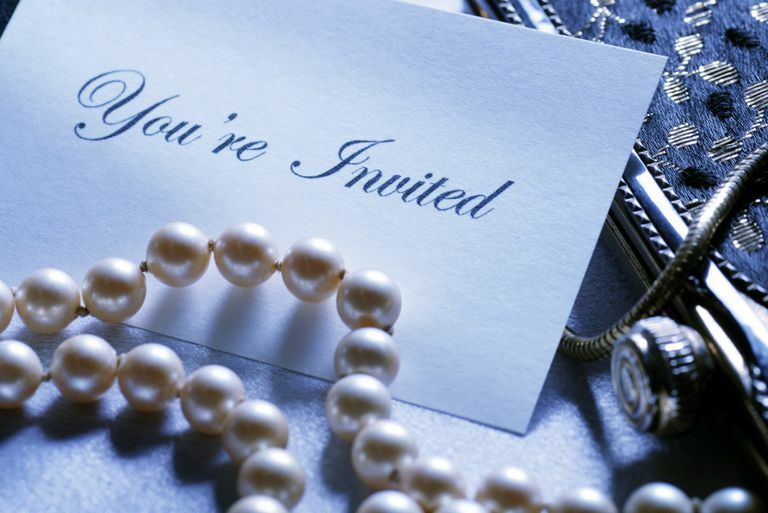 Is this an elegant pearl party or one where sandals and shorts are appropriate? For example, you might ask guests to bring a wedding photograph of themselves. It adds to the decor, of course, but your guests also will enjoy trying to figure out who's who. There are some very creative ways that you could make your paper invitations a little more special. Slip a folded invite into an oyster shell. Include a strand of artificial pearls in a small box. Break apart a fake pearl necklace from the thrift store and paste a single pearl inside each card. Print cards that are simply one large, beautiful pearl, then cut them out to shape. It is easy to go elegant with a pearl theme and don't forget about the more shabby chic version of beach life as well. A trip to the fabric or craft store will open up the possibilities in your mind. Look for opalescent or sea-blue cloth and linens. For that shabby beach look, add denim to the mix. Find strands of artificial pearls in various colors. Pick up beach grasses (real or artificial) to place in tall vases. Place sand with pearl like marbles in flat trays to act as beachy centerpieces. Seek out gazing balls that have that pearl-like sheen. Even children's toy balls have potential with the right finish. If you come across a giant oyster shell... Winner! Go back to that vision exercise and imagine what music might be playing on the beach. Everyone's take on 'pearl' music is going to be a little different and what you choose can direct the party's atmosphere. Let's not forget about Janis Joplin's Pearl album! Whatever pearl-ish tune floats your musical boat. Choose your favorite, crowd-pleasing foods - an Italian feast, perhaps? How about oyster and caviar? A grilled seafood feast or an old-fashioned beach seafood boil are fun as well. Pour Champagne, serve up gin and tonics or another clear cocktail over special "30" ice. To Make Numbered Ice: Pour tinted water into an ice cube tray that makes number-shaped ice, then pop the 3s and 0s out. For dessert? Cupcakes in opalescent wrappers adorned with Godiva chocolate pearls. And don't forget the party photo booth to capture all those new memories.